The US bank prime rate was unchanged as of mid-March, at 3.25 percent. 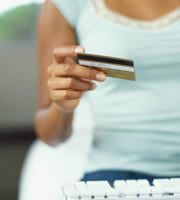 While the prime rate has stayed the same for over three years now, credit card rates have been much livelier of late. This hasn't generally worked in favor of customers. Of eleven changes in average credit card rates across five categories so far this year, eight have been upward adjustments, while only three have been moves toward lower rates. Two of those three downward shifts in credit card rates occurred in the first half of March. That period also defied another prevailing trend: the spread between credit card rates for excellent credit customers and those with average credit had been rising sharply in recent months, but contracted a bit in early March. A narrowing of this credit-quality spread would suggest growing optimism about the economy on the part of credit card companies. The trick, from a customer's standpoint, will be for that optimism to remain strong enough to affect the credit-quality spread and the availability of credit, without it translating into higher interest rates, which are often a by-product of strengthening economies. Average rates for consumer credit card offers held steady at 15.03 percent in early March, while rates for consumer rewards credit cards fell to 17.66 percent, a reduction of 17 basis points. As a result, the overall average for consumer credit cards dropped to 16.87 percent, 12 basis points below their level at the start of March. The decline for consumer rewards credit card rates, and for consumer credit cards overall, bucks a trend that had seen both averages rising so far this year. Meanwhile, the fact that consumer rewards rates fell while non-rewards credit card offers held steady continued a trend in the relationship between rates for those categories. In the latter half of 2011, the spread between consumer rewards and non-rewards rates rose sharply, peaking at 2.96 percent at the end of the year. 2012 so far has been a different story. This spread has been shrinking steadily, and in the most recent credit card rate survey was down to 2.63 percent. A lower interest rate premium for rewards cards makes reward programs more attractive than they had been, though the best way to get value out of a rewards program is to generate points through activity while paying off the balance in full each month. This way rewards are earned without paying an interest rate premium. Along with other consumers, students got a bit of break in the first half of March. The average rate on student credit cards fell by 8 basis points, to 16.98 percent. This represented the first drop in student credit card rates since last August. Business credit cards remained unchanged, at average rates of 14.74 percent for non-rewards cards, and 15.53 percent for rewards credit cards. This lack of change has become the norm in the business credit card categories. Business non-rewards credit cards have been unchanged since the end of November, while business rewards credit cards have changed just once in that time period. The spread between rates for excellent credit customers and those with average credit narrowed by 9 basis points, to 4.23 percent. While hardly a full reversal of a trend that had seen this spread grow by 63 basis points in the first two months of 2012, this narrowing, if continued, would be welcome news to customers with less-than-perfect credit. 0 Responses to "Credit card rates dip for rewards and student credit cards"